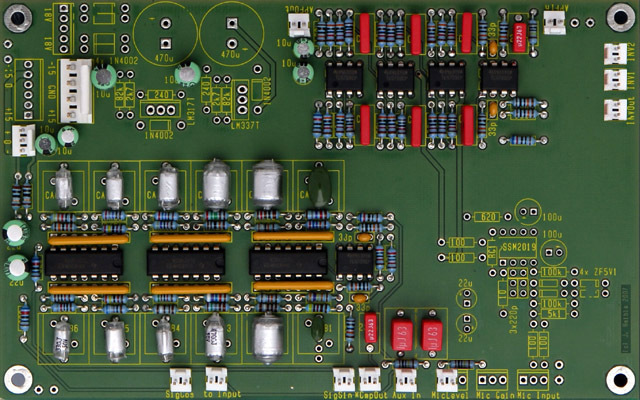 Note: The original Jürgen Haible website is no longer active but PCBs are being released at http://www.jhaible.com. 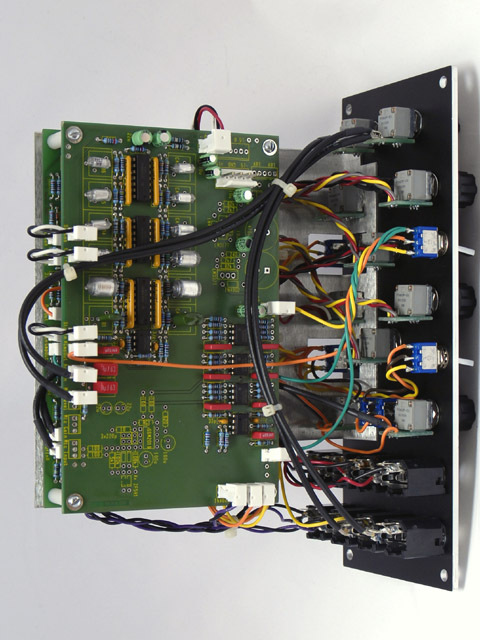 I built the Jürgen Haible Frequency Shifter module as discussed in the Electro-Music forum. I built this in a 2U MOTM format with an aluminum bracket to mount the PCBs piggyback and also clear the various front panel controls. I purchased a minimum order quantity of 240 BI Technologies P260P potentiometers to use for my projects. I like them quite well and have some information here. I also use the potentiometer chiclets from John Loffink. There are so many connections and calibrations for this board that I chose to use MTA connectors for all front panel controls. I chose to socket only the MC1496 and LM13700 ICs. Here are the finished PCBs. I only have paper copies marked up with my modifications. They are not pretty but are available here. I eliminated the exp polarity switch and modified the expo cv attenuator to a reversing style. On board1 I changed R2 from 51K to 36K, added an additional 36K resistor to pin 6 of U1, and wired the attenuator similar to the linear cv control circuit. I added a separate feedback attenuation control to pins 1 and 2 of the Mic_Level connector. The bypass switches route the input to the respective outputs but they do not affect the feedback control so the output may still be shifted. 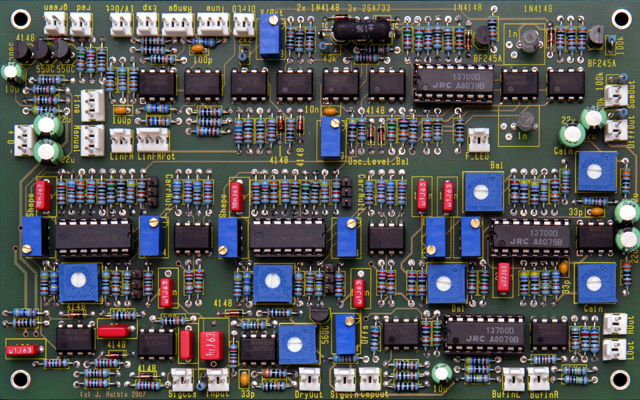 I changed R96 to 68K on board1 and R20 and R21 to 100K on board2 to reduce the input gain. I added an output which adds SumOut and DiffOut by using U8A on board2. I changed R51 to 51K on board2, connected Inv1 to SumOut, Inv2 to DiffOut, and InvOut to the Out jack. I changed R46 to 510R on board1 to make the freq LED brighter. The jumpers on board1 above R49 and R80 by the CarrNull text are not used and can be omitted. 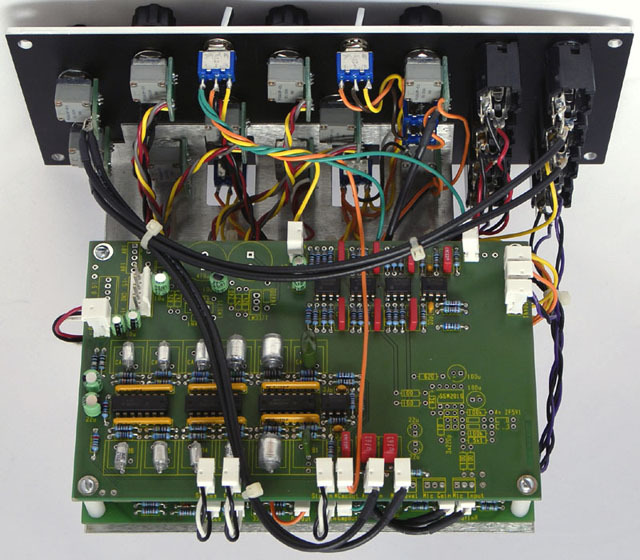 The unmarked radial mounted resistor between the SigCos and Input connectors is R95, 1M. You must slightly bend the 100K and 4.7M resistors leads if using MTA 0.100 for Tune and Exp connectors. Most of the polyester film capacitors in my part number list have 5 mm spacing. These need to be bent to fit the 7.5 mm PCB footprint on several of the capacitors. The 22 µF capacitors in my part number list are slightly large and need to have the leads bent to fit the back-to-back locations on the PCB. I changed C3 and C4 from 10 µF tantalum to 22 µF electrolytic to use with the DC power connector. C1, C3 and C7 are in parallel (as are C2, C4, and C8) and loads the DC power connector with 54 µF. I would recommend leaving C3 and C4 off to lower the capacitance to 32 µF on the DC power connector. There are thirty-seven 100 nF SMT capacitors, not thirty-five. The last sentence in the 5th step of calibration should be to adjust R119 to get approx 5V pk on DiffOut, not R110. This design has a large manual knob and nine small knobs to fit into a compact 2U format. I eliminated the mic input and the output level attenuators and added a second input that is normalled to the feedback switch. I eliminated the exp FM polarity switch by changing the exp cv attenuator to a reversing style similar to the linear cv attenuator. Out is the mix of SumOut and DiffOut. Here is a scope image showing the sum and difference with a 69 Hz sine wave. I am using my Mankato filter to generate the ~69 Hz input sine so it should be pretty clean. 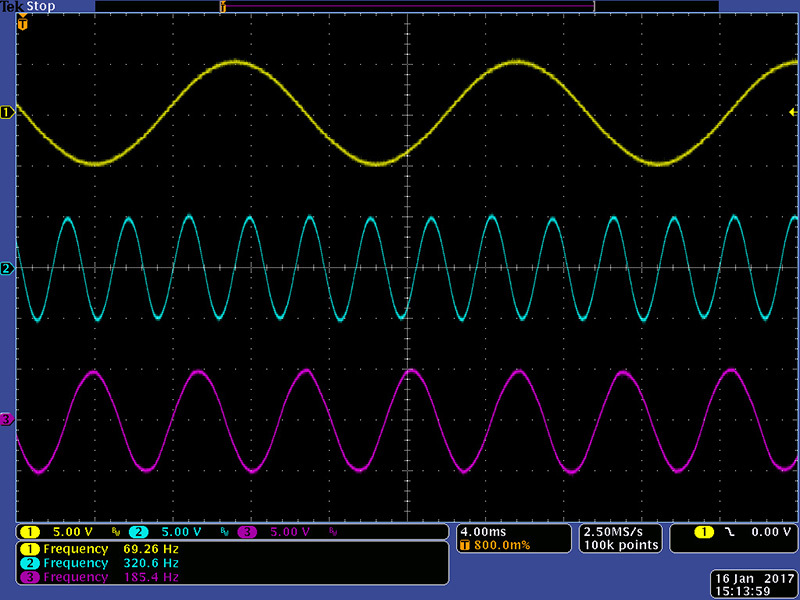 The internal oscillator is running ~253 Hz so it produces a sum (cyan) of ~320 Hz and a difference (magenta) of ~185 Hz.